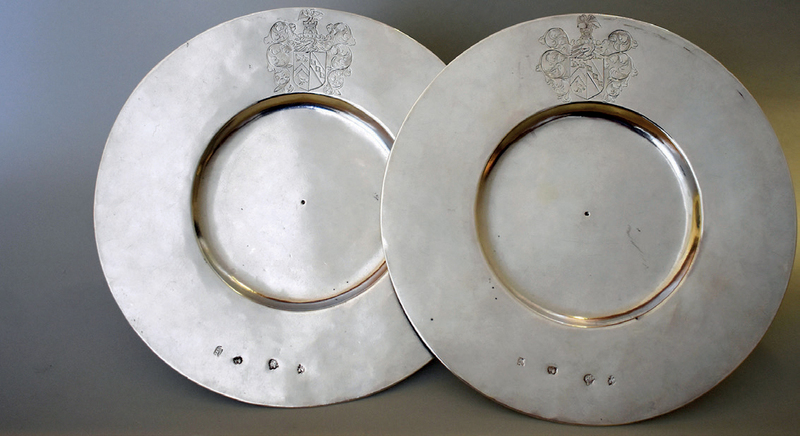 This pair of Commonwealth silver plates, London 1645, bear the contemporaneous arms of the Puritan Bulstrode Whitelocke (1605-75). Whitelocke was an English lawyer, writer, parliamentarian and Lord Keeper of the Great Seal of England. On the outbreak of the English Civil War he took parliament’s side, using his influence to prevent Charles from raising troops in Buckinghamshire and Oxfordshire. The simple broad rim form of these plates, each measuring 9in (23cm), corresponds to contemporary pewter plates of the time and was a feature in vogue from c.1640-80. Few survived the great ‘melt’ of the Civil War period. Consigned by a local private lady, they were estimated at £10,000-12,000 apiece in a sale at Stride & Son (18% buyer’s premium) in Chichester on November 15-16. The buyer of the first dish had the option of taking the second at the same price – and did so at £10,000 each.